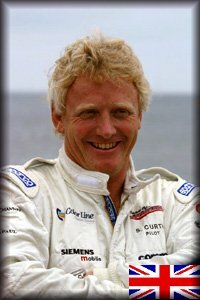 Steve is considered the best international powerboat racer of all time holding the record for the most Grand Prix (36) and Pole Position (38) wins, he has also won the Class 1 Powerboat Championship an unbelieveable 8 times. His first two titles were won in the USA in 1985 becoming the youngest ever Class 1 champion and the first Briton to win the title. He won his next title in 1987 but it wasn't until 1998 until he won his third title as throttleman on Spirit Of Norway. With driving partner Bjorn Rune Gjelsten he back to back championship wins in 2002, 2003 and 2004. Steve and Bjorn became the most successful partnership in Class 1 history. In 2005 Bard Eker took over the Spirit Of Norway team. The championship went down to the wire but Bard and Steve took the 2005 World and Pole Position championships. In 2006 Steve once again paired up with Bjorn Rune Gjelsten and they proved the old magic was still there taking all 4 titles (World Championship, Pole Position Championship, Middle East and European titles). Outside of the cockpit Steve runs the family business (Cougar Marine). He also supports the Honda Formula 4-Stroke Powerboat Championship in the United Kingdom. Steve became the recipient of the Segrave Trophy in 2003. This is awarded to the Briton who has demonstrated an outstanding performance in a powered vehicle. Previous winners include Sir Malcolm Cambell, Sir Stirling Moss and Sir Jackie Stewart. He was also awarded the 2004 Yachtsman of the Year. In 2005 Steve took his 7th World Championship title! In 2006 Steve was awarded the MBE (Member of the order of the British Empire) by Her Majesty Queen Elizabeth II in her 80th birthday honours list. "I am totally surprised but of course very honoured to receive this award, and also proud that powerboat racing has received this level of recognition." said Curtis.